Today AGSs P.P.Rao and Sanjeev met Sr GM Establishment Sh Saurabh Tyagi and discussed on the issue of GTI. He assured to look into the issue..View Copy of the letter of GS to GM training regarding GTI deduction. Further it was also informed that the Pension Contribution on actual basis is pending in Ministry of Finance (MoF) and today they are trying to meet the concerned Officers in MOF. 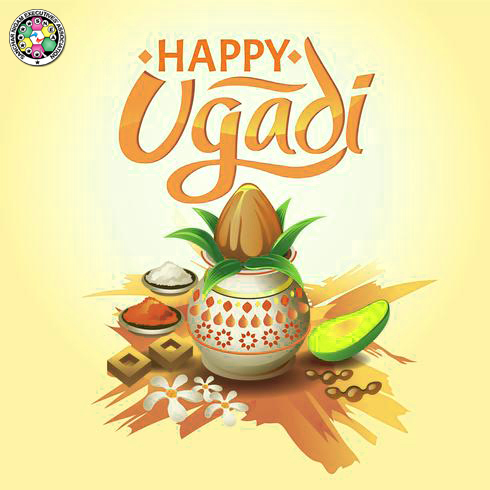 All CHQ Office Bearers, Circle Secretaries, CWC Members, Circle Office Bearers, District Secretaries, CEC members, District Office Bearers should educate and ask all Executives in their local Whatsapp group to retweet the message. The Twitter message is sent to Hon. Prime Minister, Hon. MoS(C) sir, DoT, and all Electronic and Print Media also. Today AGS P. P. Rao and AGS SANJEEV met DGM PERS and requested for speeding up the process of DPC. DGM PERS was enquiring that other Associations are asking for DGM Adhoc instead of REGULAR. We requested DGM PERS that DGM PROMOTIONS needs to be given immediately as there is Accute shortage and when Administration is ready to give DGM REGULAR, we welcome it. On Friday CHQ President, GS and we both AGSs met PGM Pers in the presence of DGM PERS 1 & 2, AGM PERS1& AGM DPC. PGM Pers instructed Pers and DPC Sections to complete the process of DPC along with calling VCs for conducting DGM (Regular) DPC..We also discussed on the issue of SOFT TENURE and transfers in Circles. PGM Pers assured to give approval to Circles for transfers within Circle, if the Circles give the justification /Requirement. On the issue of SOFT TENURE, he assured to act as per the instructions of Dir HR. India Post is now top loss-maker, pips BSNL & Air India. BSNL hits rock bottom after losing rural edge. BSNL, MTNL 4G launch back to square one. Govt action is key to telecom PSUs survival. Now, an App to help you decide the best telecom service provider in your area. Details of booking for Gratuity (Paid or Payable) to Directly Recruited Employees of BSNL during the FY 2018-2019 reg.. View Corporate office instructions. BSNL, MTNL suffering due to decisions taken under UPA regime, says Telecom Minister. Telecom dept sets up insolvency panel to tackle issues faced by telcos. Industry leaders discuss next telecom revolution at India Mobile Conclave. Compassionate Ground Appointment (CGA) - Keeping in Abeyance thereof reg. Guidelines relating to transfer and posting - rationalisation of expenditure reg. Government to relook into BSNL 2G spectrum expiry. BSNL, MTNL asset sale proceeds to clear debt, fund VRS. BSNL narrows down loss to Rs 7,500 crore in FY 2019, cost-cutting pays: Chairman. BSNL collects record Rs 6,500 crore in revenue from enterprise division. BSNL revival to take time, DoT to assist financially. Association will take a call on VRS proposal once details are available. We have to examine whether it is linked with 3rd Pay Revision and Pension Revision or not, how funding is going to be done and which way it is going to benefit BSNL. We have to examine whether it is beneficial to the employees as well as the company. As a matter of principle, SNEA is not in favour of any kind of retrenchment including VRS. i) Implementation of new Promotion policy to bring parity with those Executives got promotion on 29.06.2018 or later, who are juniors: We requested CMD to take necessary action to implement the BSNL Board decision for bring parity and uniformity in promotions and ensure justice to all the Executives of BSNL. Thousands of seniors are facing humiliation as their juniors are promoted on 29.06.2018. Executives recruited for the same or earlier year are also deprived promotion along with others. The upgradation done only for few cadres, citing court cases, on the promise that others will be given promotion through the new promotion policy, at par with others. This promise is not implemented so far. During discussion, CMD informed that it is a BSNL Board decision and it has to be implemented at the earliest. CMD assured to discuss with DIR(HR) and do the needful immediately. 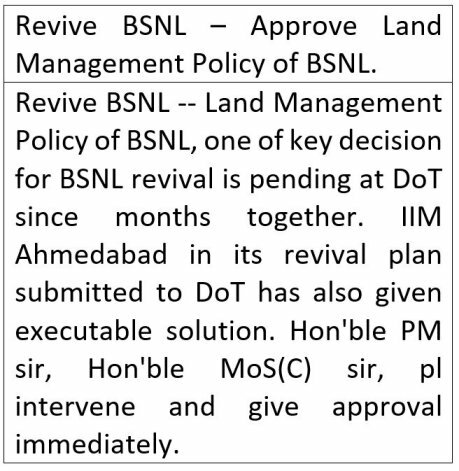 If there is no progress, CHQ is planning for some program infront of the BSNL Board meeting on 16.04.2019.
ii) Meeting at PMO on 02.04.2019: CMD briefly informed that 3rd PRC, the revival proposal, 4G allotment, land monetization etc discussed in the PMO meeting. Issues are taken a definite shape and Govt trying to speed up the process and getting the Cabinet approval in the shortest time. BSNL proposal for land monetization by BSNL itself and the land monetization through DIPAM will take place simultaneously. 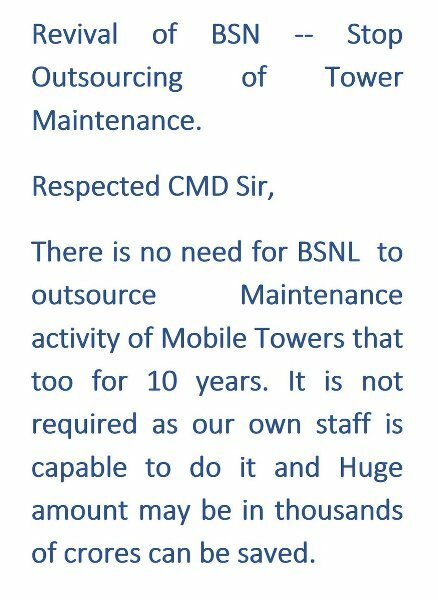 From Assn side we categorically told that any restructuring of BSNL has to be done along with 3rd PRC implementation and pension revision, otherwise it will not be successful. 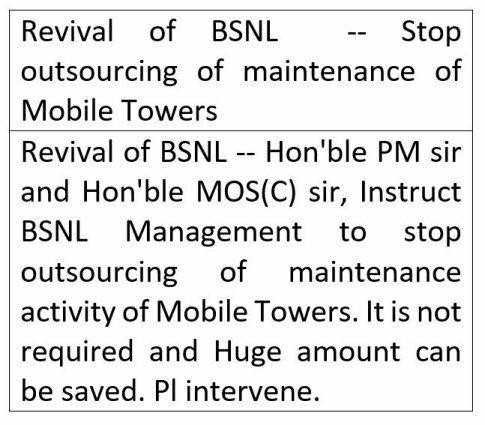 After the strike on 18-20, February, media and public outcry on revival of BSNL, Govt forced to act very fast on the revival proposal, on the direct supervision of PMO. Daily meeting taken place between BSNL and DoT at highest level to sort out the issues. The Letter of comfort and Presidential sanction for expenditure on OPEX, which was flatly denied by DoT during discussions, extended within days. iii) DGM promotion: We expressed our serious concern in the abnormal delay in DGM promotions on flimsy grounds. About 1,000 DGM vacancies are available now. We demanded filling up of all the vacancies on regular basis. Also giving GM entrustment charge to the regular DGMs already working. CMD assured to expedite the DGM promotions. Since one of the DPC member (CLO) was not signed the DPC minutes earlier and another member retired now, it is learned that fresh DPC is to be held. We are in constant touch with PGM(Pers) and Pers section and monitoring the progress. Due to obvious reasons, not reporting the progress in the websites. Bleeding telcos: How telecom industry fared in Oct-Dec 2018 - View Media Report. March started from BSNLCO at 11.30 hrs. List no 6&7 seniority: Hon Supreme Court (2 Judges Bench) dismissed the SLP in view of the judgment of Supreme Court judgment dated 12.08.2014 by the 3 Judges Bench. All the Circles are requested to bring maximum employees for the March in coordination with constituents of AUAB. 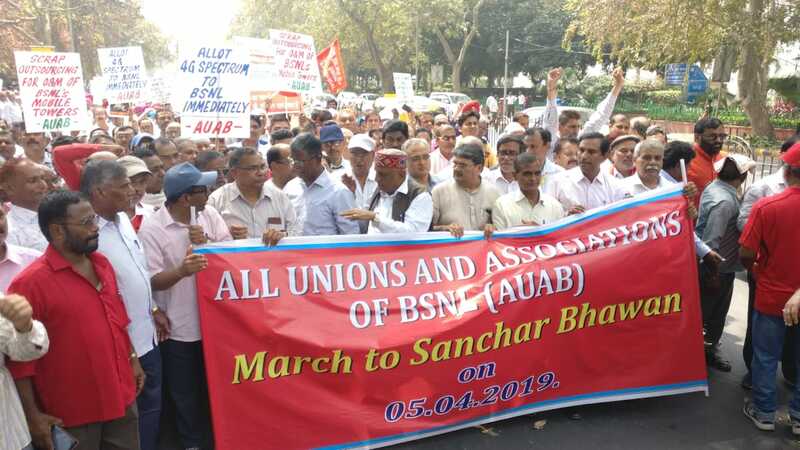 The CSs and other office bearers of BSNLCO and NTR has to take special efforts for the success of the March. The March will start from BSNL CO at 11.30 Hrs. » Trai to seek views on net neutrality compliance soon. » Fire in BSNL godown destroys wires, equipment worth Rs 5L. Copyright (c) 2011 sneaindia.com. All rights reserved.